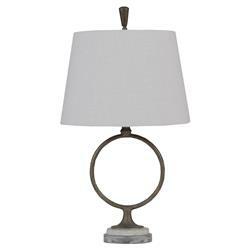 A magnificent mixture of antique metal, faux white bone and clear acrylic make this table lamp an alluring accent. The open gold ring is glamorous and understated, creating a bold statement in even the smallest spaces. Polished bone adds an opulent layer atop the clear base and mirrors the wonderful white shade.